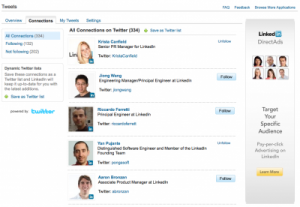 Sometime in November last year, LinkedIn started rolling out some Twitter integration features. If you’re one of those LinkedIn members who integrated your LinkedIn accounts with Twitter, you might also want to go deeper into these integration and install the Tweets app. This new LinkedIn feature lets you easily find and keep track of your LinkedIn connections on both LinkedIn and Twitter. Once you’ve installed that Tweet app, you can access this from your Profile page by clicking on the “more” tab which you can find at the top of your LinkedIn profile page. Clicking on that “more” tab will display your Twitter public timeline including tweets from people you follow. From that page, you can post tweet to your account. The new Tweet app also has a new module called – “connection to follow.” What this module does is to give you recommendations on new people to follow which are your LinkedIn contacts. Another nice feature of the Tweet app is the “connections” category which list down your LinkedIn connections who have already installed the Tweet app. From there you can see their Twitter information, follow or unfollow them and see a sample of their last tweets. If you’re into Twitter lists, the new LinkedIn Tweet app also lets you create a dynamic Twitter list consisting of your LinkedIn connections. 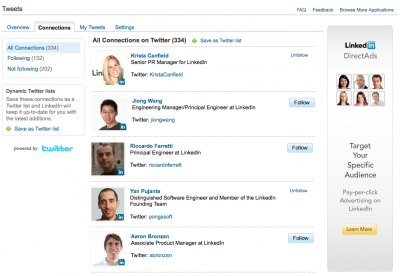 This list displays tweets of your LinkedIn contacts and are updated real-time. It’s like your usual Twitter list built into your LinkedIn accounts. Alright, enough of this blabber. If you’re into LinkedIn and Twitter, might as well integrate these two accounts. Â You may install the LinkedIn Tweet app from this link. With these two useful LinkedIn features integrated, it is now easier to sort through the list of people your may know by companies and schools. You will now be able to easily page through all of your suggestions on the landing page and quickly sort through them by company or school as well as find out which connections you have in common with other LinkedIn members. From the landing page of the filtered “People You May Know” suggestions, you can filter the results further by various ways to help you find the business contacts that you may have been looking for or possibly chanced upon somebody which you didn’t think you can reconnect to again. To see the list of people on LinkedIn that you may know, simply click on the “See More” link on the People You May Know box on your LinkedIn profile page. From there you can start scouring through the list and hopefully gets to find contacts and continue building your LinkedIn network. Rationalizing the roll-out of this feature, the LinkedIn official blog states that this will help LinkedIn memeber to stay in the loop on new developments, potential business opportunities or even job opportunities by simply following a company. Â Following a company, just like following a brand profile in Facebook also lets you get the first hand information about developments at companies you follow. So, how do you follow a company on LinkedIn. There are various ways to do so. First, you can click through any of the companies listed on your LinkedIn contacts’ profiles. Once you find a company that interest you, you simply mouse-over on that company and the “Follow Company” icon will appear on a hover bar. You can also follow a company right on the company’s profile whenever you chanced upon them as you search on LinkedIn. To easily find a company profile, you can check out the “more” drop-down list from LinkedIn’s homepage. Now here’s the interesting part. LinkedIn also allows you to choose the volume of updates that you want to receive from various companies you follow. You can select the type, frequency and format of updates as well. Like the features so far? So, what are you waiting for? Start following those companies now and wait for the fruits of what you are about to do, hopefully the soonest time possible. It’s good to know that despite their not so great traffic and overall ranking as a social networking site, LinkedIn is still trying to improve its services, features and functionality. In a way the site is trying its best to be in tune with the norm among popular social media services that include the likes of Facebook, Twitter, Google Buzz among others. So now, LinkedIn has just announced several new features that would make sharing news within your LinkedIn networks easy. Since, LinkedIn is business social network, you all know how valuable news information are among business networks. 1. Get complete control over who sees what you’re sharing – be it everyone, individual, a group or connections. 2. Post article excerpts and images to what you are sharing. This will attract more attention from people you share it with. This feature lets you customize your message to people you are sharing the news with. 3. Preview, edit and delete posts before your LinkedIn contacts noticed that you’ve type something incorrectly. 4. Like and re-sharing of news feature in a single click. It also allows you to share news bits to multiple LinkedIn contacts. 5. Improved off-site sharing experience that lets you share news items you encounter while reading online newspapers such as WSJ and NYT. 6. LinkedIn’s very own URL shortener (lnkd.in) when sharing link to news items. 7. Attribution of re-shared items to the person who originally shared the items with you. 8. Share items on your LinkedIn profile to those who view your profile. There you go, 8 new sharing features of LinkedIn that hopefully would make you a more informed LinkedIn member. Still looking for that dream job which has eluded you for so many years? LinkedIn might be able to help you out with its newly updated Job Seeker Premium Account. Â Based on consultations with hundreds of job seekers, the LinkedIn Job Seeker Premium Account aims to help you stand out from the crows, reach out to hiring decision makers, manage your job search more effectively and of course, its ultimate goal to help you snag your dream job. In line with this, LinkedIn is also sponsoring a Job Seeker Webinar to be hosted by career expert Lindsey Pollak. The seminar aims to guide you on how you can best use LinkedIn to find your dream job as well take better control of your career. The seminar will provide you with useful tactical tips on how you can possibly maximize the use of LinkedIn’s free and premium services. The seminar isÂ free for all LinkedIn members, and you can sign upÂ here. LinkedIn’s Job Seeker Premium Account is a welcome development on what Â LinkedIn can possibly offer. It’s a step in the right direction and somehow fulfill LinkedIn’s dictum of being a business-based social networking site.